I think there will be repercussions for that pipeline. Repercussions? As in drone missile attacks on the pipeline construction? Or just taking out various Pakistani governmental officials? Sanctions against Pakistan? Declarations that various political parties are terrorist oranizations? Hooray for the Keystone Pipeline Middle East version! @bsbafflesbrains: Actually, you didn’t need the snark tag on that. 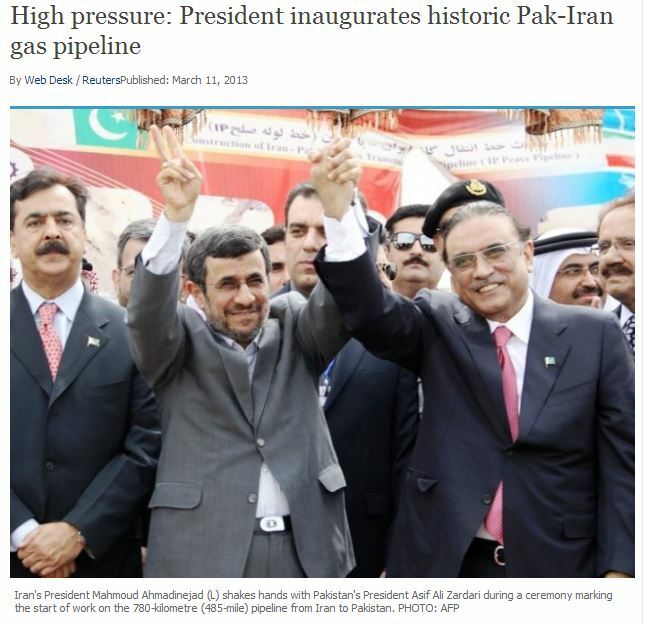 There was a report a few weeks ago where, although the records are pretty limited, it seems pretty likely that the US military bought gasoline for use in Afghanistan that most likely came from Iran, in violation of sanctions. Karzai will follow up with a sternly worded letter. @jawbone: If you hadn’t noticed, the Sunni vicious attacks on the Shia in Baluchistan that have been occurring for over a year are directed by the U.S. at derailing pipeline construction. Pipeline will go directly thru Baluchistan.